The safety of food has always been important, but food scandals, such as the 2013 horsemeat scandal, the 2011 EHEC outbreak in Europe, and the 2008 Chinese milk scandal involving melamine, along with well-publicized product recalls, have heightened public scrutiny of food manufacturers and awareness of product safety. Consumers and retailers alike are demanding food manufacturers make their manufacturing processes as safe as possible. 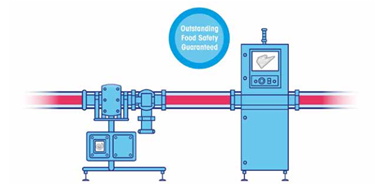 Food product inspection systems support compliance with food safety standards by eliminating physical contaminants on pumped food lines. When properly installed and operated, product inspection technology, such as x-ray inspection and metal detection, can help to reduce contamination and improve the safety of pumped food products.